October this year is the first year of National Reuse Month. Launched on September 3rd by Denis Naughten, the Minister for Communication, Climate Action and Environment, it is an initiative to reduce waste and encourage people to remake, reuse and repair things that would otherwise be discarded and unloved. I have long been a fan of reusing and upcycling, it's a principle I try to apply to my candlemaking business as much as possible. There is a certain joy in making something into a new and beautiful item and it gives me a creative challenge as well as the satisfaction of saving containers from being thrown out. To celebrate National Reuse Month, I have been invited to take part in a free event on the 27th October in the Claregalway Hotel. 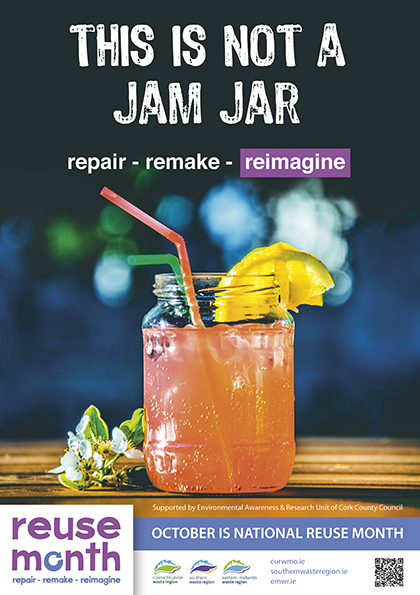 In conjunction with Galway County Council and Speco Services, it is a showcase of all things upcycled and remade. Featuring myself of course and also a range of other crafts and skills, it is a great opportunity to see recycling in action. I'm very excited about showing off my products and learning a little bit about how others create and reuse. This event is one of many run around the country - Dublin City Council will host a reuse Expo on Tuesday the 25th October from 12.00 - 3.00 p.m. in the Civic Offices on Wood Quay and you can check out a full listing of events here - Reuse Month East/Midlands Events. For further events around the country here are details for South Reuse Events and Ulster Connaught Events. Use jars as pencil holders or kitchen storage - there are so many lovely ways you can decorate and personalise items like this. Stickers, chalk paint, glass markers, ribbon are just some of the things you can use to decorate tins and jars. Always try to donate old clothes (in good condition) to charity shops rather than throwing away. Keep gift bags and repurpose! Instead of buying wrapping paper, reuse old paper or keep little boxes and nice paper (even magazines or old newspapers can make funky gift wrap presentation). If you would like to take part in Reuse Month, use the hashtag #reuse16 and I will retweet as many as I can or send me your projects or ideas and I will share on my Facebook and Twitter. Let's work to make the world a cleaner place. I do try and reuse when i can rather than waste. I do love a wee rummage in a charity shop too! I had no idea there was an actual National Reuse month. We do try to always reduce, re-use and recycle but reminders are always good. I will see what we can reuse! What a great campaign to be a part of. I try, but I do throw away far too much.